5G is not just about the Radio Access Network (RAN). Next-generation wireless is going to need a lot of help from wireline technologies to deliver on its promises. 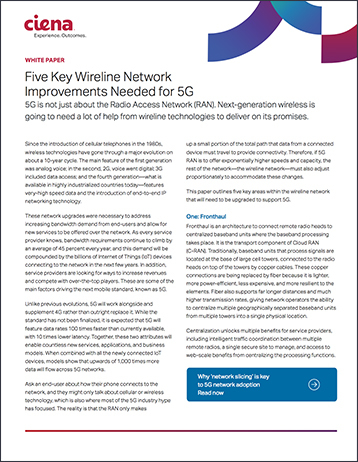 This paper defines five key wireline network improvements that are needed for a service provider to be ready to deploy 5G services. The Internet of Things is coming, and there is a litany of ways they can be connected to the network. Ciena's Brian Lavallée details the options, and where 5G fits among the choices for IoT connectivity. 5G is coming, and with it a host of new terms and acronyms. We try to make sense of it all with definitions for the ones that matter most for the future of 5G network architectures. Ciena CEO Gary Smith describes how the “greenfield” nature of India’s digital revolution is allowing it to use mobile access to leapfrog more advanced economies. This article was originally published on Techonomy. Get the insights you want. Subscribe to the latest news on optical networks.